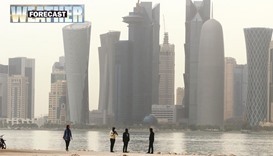 Cold weather continues around Qatar as the minimum temperature is expected to drop to 11C in Al Khor and 13C in Doha Sunday, weather charts show. The Met department also tweeted last night that northwesterly winds will continue to be active this week, with the weather becoming colder at night and early in the morning. The temperature is expected to drop below 8C in the southern and remote parts of the country. Sunday’s forecast also says strong winds are expected in some places at times. Offshore areas are also likely to experience similar windy conditions Sunday along with high seas. Northwesterly winds will blow at a speed of 8-18 knots inshore, going up to 22 knots occasionally. Offshore, the wind speed (northwesterly) will be 15-25 knots, reaching a high of 35 knots. It will be relatively cold during the day and some clouds and slight dust are also expected in certain inshore areas. Cold conditions will prevail at night, too. Meanwhile, the weather report says it will be partly cloudy at times in offshore areas too, with the sea level rising to 13ft. Recently, the Met department had said in a report that a cold spell was expected in the country due to the effect of strong northwesterly winds. Accordingly, temperatures saw a noticeable drop over the weekend and the conditions are likely to continue Sunday as well. 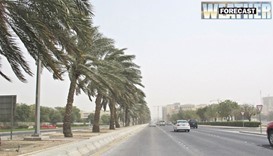 On Sunday, the minimum temperature is expected to be 11C in Al Khor (down from 14C Saturday), 12C in Wakrah (15C Saturday), 12C in Mesaieed (14C Saturday), 12C in Abu Samra (14C Saturday), 13C in Doha (16C Saturday), 15C in Dukhan (16C Saturday) and 16C in Ruwais (17C Saturday). The maximum temperature, on the other hand, will be around the same levels as Saturday - 20C in Doha, Wakrah, Mesaieed and Al Khor, 18C in Ruwais and 17C in Abu Samra and Dukhan. 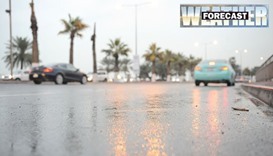 Turayna was the coldest place in the country Saturday at 13C, while the lowest maximum temperature was recorded in Abu Samra and Dukhan at 17C each.